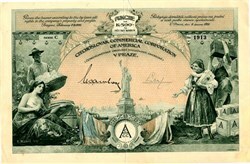 Beautiful certificate from the Czechoslovak Commercial Corporation of America issued in 1926. This historic document was has an ornate border around it with a vignette of a picture of the Statue of Liberty and a group of allegorical people which was painted by the Czech painter E. Bohac in 1919 and published by "UNION PUBLISHING PRAGUE". This item is over 92 years old.